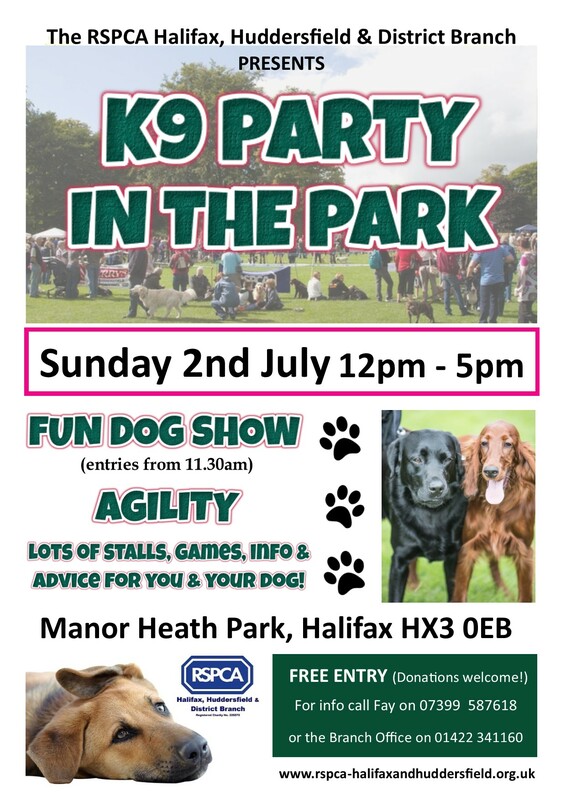 The RSPCA Halifax, Huddersfield & District branch are inviting all two legged and four legged friends to their annual K9 Party In The Park this weekend. The self funded branch is hoping to raise crucial funds for the animals in their care, whilst having some fun in the sun and partying with local supporters and their canines! The event is free but donations are greatly received and all party-goers will receive a free goodie bag! The dog show can be entered from 11.30am on the day and is just £1.50 per class. ‘Best Rescue’, ‘Puppy Love’, ‘Best Junior Handler’ and ‘Celebrity Dog Look-a-like’ are just a few examples of some of the classes that will be running on the day. To find out more about K9 Party visit the RSPCA Halifax & Huddersfield branches website here: www.rspca-halifaxandhuddersfield.org.uk. You can also find out more on Facebook by searching for ‘K9 Party In The Park 2017’ in local events.